The Prizmatix Optogenetics-LED-STSI module is specially designed to provide Optogenetics Stimulation / Silencing to the same neural structure in freely moving mammals. 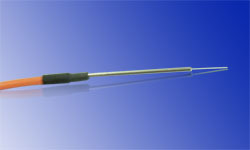 The device combines two LEDs of different colors into same single output fiber. Each LED has independent power and switching control. and other wavelengths upon request. The Optogenetics-LED-STSI based system enables bilateral activation / inhibition with single device and single one-channel rotary joint for significant cost saving and without compromising power at implant tip. High Power density (>220 mW/mm²) at cannula's fiber tip following all fiberoptics connections and rotary joint. Unique large and powerful LEDs enable bilateral illumination with single LED and rotary joint for significant cost saving and without compromising power at implant tip. Prizmatix‘s unique large emitter LEDs enable bilateral stimulation with a single low cost light source and simple one channel rotary joint. Using a simple Y-shaped fiber bundle at the rotary joint will double the amount of light delivered to the brain each branch delivering virtually the same power as a single fiber. This results in significant cost saving in setting up bilateral brain activation and silencing systems, compared to alternative light sources. Prizmatix Rotary Joint is especially designed for Optogenetics experiments with High NA fibers equipped with FC connectors. Rotary Joint very low friction and smooth swivel operation are demonstrated in this video - showing continuous rotation for over 30 seconds after a fingertip startup. The torque required for free movement is very low thus reducing the Rotary Joint's behavioral effect on freely moving animals. 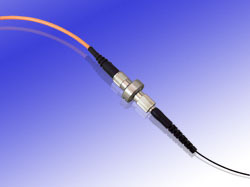 Prizmatix Rotary Joint can be used with large core input optical fiber connected to several thin output fibers simultaneously. This allows concurrent delivery of light to separate areas of the brain without loss of power due to the fiber split. Prizmatix Implantable Fiberoptic Cannulae / Ferrules allow direct light stimulation of certain deep brain regions in living animals. 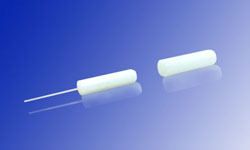 Each Cannula consists of a Zirconia ferrule accommodating a high NA Silica optical fiber, protruding from the Zirconia ferrule at a desired length. Prizmatix offers a wide range of standard and customized multi-mode silica / polymer fibers as well as ferrules for optogenetics research. A Y-shaped fiber bundle is especially useful for activating two brain hemispheres simultaneously: a 1000μm or 1500μm fiber is coupled to the LED and connected to one side of the Rotary Joint. From the Joint’s other side emerge two thin fibers which can then be connected to two separate ferrules: the light from the LED is divided equally between the two hemispheres without any loss of power. The Pulser USB to TTL interface box with user friendly software is an easy way to generate trains of pulses for Optogenetics activation directly from your computer. See more..